Time for another golf knowledge contest! Last year Bernard McMartin of Rehoboth Beach won this column’s first golf knowledge contest, with a near-perfect score on a series of golf trivia questions. For his efforts he picked up a sleeve of golf balls from our friends at the local Golf Day store. This year’s contest goes beyond trivia to include a few tricky rules questions. The prize is a hardbound copy of Troon McAllister’s The Foursome, the funny new golf novel ((Doubleday, $23.95 SRP). 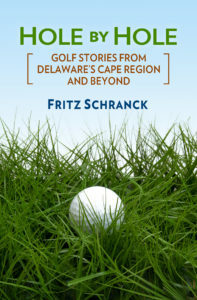 All entries must be either dropped off at the Cape Gazette offices at 36 Midway Shopping Center, or mailed to P.O. Box 213, Lewes, DE 19958, or sent by e-mail to fschranck@holebyhole.com. The deadline for entries is July 20. The winner will be announced in an upcoming column. Good luck! A. You’re playing a round at Rehoboth Beach Country Club. You hit a towering fade off the 18th tee, only to watch helplessly as it heads toward the out-of-bounds stakes on the right. You “take a provisional” that naturally lands in the dead center of the fairway 235 yards out, and then trudge up to the right rough to look for the first ball. The good news is that the ball stayed in bounds. The bad news is that you can’t hit the ball without hitting an out-of-bounds stake just behind it. You see that the stake is loose, so you lightly take it out of its hole, belt the ball down toward the green, and put the stake back. 1. Was there a rules violation for moving the stake? 3. What’s the penalty in stroke play, if any? 4. What’s the penalty in match play, if any? 5. Why are provisional shots always so much better than the shot that made you take the provisional in the first place? Describe the meaning of the following phrase: “No good hole (or no good drive) goes unpunished.” Give an example from your personal experience. C. Your golfing buddies sometimes call you the Roberto Duran of Putting. What does this mean? D. A friend from the Deep South is playing golf with you. Immediately after one of his drive, he shouts, “Run! Run like y’all stole somethin’, you sumbitch!” Describe his tee shot, and what he really means. E. You buy a build-it-yourself driver from a major club component seller, and spend a carefree six days in your basement workshop putting it together. You walk proudly to the first tee, where a normal drive carries easily over a tiny pond. The new club feels great during your practice swings. You then make a classic backswing, and bring the club down smartly toward the ball. Maybe you should have used a bit more epoxy. The clubhead whips right off the shaft, and on its first bounce smacks into the golf ball. The ball shoots forward and splashes into the pond. 1. Is there a penalty stroke for hitting the ball? 2. Where is the next shot to be played from? 3. Would it make a difference if the clubhead broke off on the second shot, instead of on the tee? F. You are in a match play tournament at Shawnee Country Club, and you walk up to your ball on the fifteenth green. The wind is blowing at its usual 15-20 knots. You place your favorite ball marker behind the ball, but before you can pick up the ball, the wind does it for you. A sudden gust moves the ball 15 feet and directly into the hole. 2. What if it rolled into a bunker instead? 3. Is it okay to smack that smile off his face?